Back in April, Star Wars: Episode VIII director Rian Johnson shared a new photo from a motion capture set, which prominently featured the beloved character Maz Kanata on the monitors. We assumed that the actress in the motion-capture gear was Lupita Nyong'o, since she played Maz in Star Wars: The Force Awakens, but that may not be the case. The actress revealed in a new interview that she hasn't worked with Rian Johnson on the sequel yet. Here's what she had to say during an interview for her new movie, The Queen of Katwe. "Rian! I haven't worked with him yet; I've yet to shoot. That's in my future." 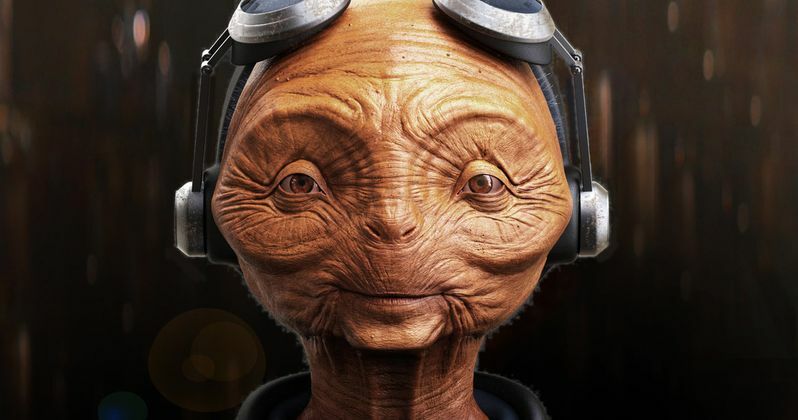 The actress wouldn't elaborate any further in her interview with Collider, but it's possible that she will film her Maz Kanata scenes during reshoots. Production wrapped in July, with director Rian Johnson revealing that he started the editing process in August. As for the earlier photo from April, the director may have been using a stand-in or a double for these scenes, before Lupita Nyong'o starts filming her scenes. We also don't know how large or small Lupita Nyong'o's role is in Star Wars 8, since no official story details have been revealed thus far. It's worth noting that, in Star Wars: The Force Awakens, her castle at Takodana was destroyed, but she has aligned herself with the Resistance. We know she is Force-sensitive, and she could prove to be an important asset in the fight against the First Order, and in revealing the true identity of Rey's (Daisy Ridley) parents. Rey had her iconic Force vision after touching the lightsaber Maz Kanata gave her, which belonged to Luke Skywalker (Mark Hamill). It's never clear what happened to Maz Kanata after the events seen in The Force Awakens, but after her bar was destroyed, she joked that she had some "cleaning up" to do, so it's possible that she may rebulid her bar. We know that Star Wars 8 will take place immediately after the events of Star Wars: The Force Awakens, where Rey met Luke Skywalker on the planet of Ahch-To. It isn't known if there will be any sort of leap forward in time after that opening scene or not, but there have been plenty of rumors that this sequel will follow Rey starting her Jedi training with Luke. As for when Lupita Nyong'o will start filming her role as Maz Kanata, that remains to be seen, and it hasn't been confirmed when reshoots may begin. A report from last month revealed that the first cut of this Star Wars sequel is almost completed, with legendary composer John Williams slated to begin work on the score sometime this month. Disney released the first teaser trailer for Star Wars: The Force Awakens in November 2014, nearly one year before the movie hit theaters, so perhaps the studio will follow the same pattern with Star Wars: Episode VIII.